WASHINGTON (CNS) — The Aug. 15 rally had a celebratory feel as hundreds turned out to mark the date in which five years ago many of the young migrants gathered near the White House applied for an opportunity at a different life. On that date in 2012, many of them were first able to apply for what’s known as the Deferred Action for Childhood Arrivals, known as DACA, giving some youth who were brought into the United States as children by their parents without legal documentation a work permit and temporary reprieve from deportation. For those like college graduate Greisa Martinez, whose only way to make a living without a work permit was to sell used cars in Texas, it meant she could finally apply for a professional job, make more money and put a down payment on a house. After applying for DACA, Jung Woo Kim, brought from South Korea to live in the U.S. by his parents, also was able to put behind a life of service-industry jobs, and put his college education to work at a California nonprofit that provides social services to immigrants and seniors. On the program’s fifth anniversary, both DACA recipients offered their testimony at the White House rally, attended by hundreds who have equally benefited, as well as their supporters, hoping the Trump administration will continue the program that changed their lives. He also later signaled he would not sign a recently introduced bipartisan bill that would legalize DACA recipients, known as “Dreamers” because of the acronym of the Development, Relief and Education for Alien Minors Act, also referred to as the DREAM Act. Those watching for signals of what Trump will or won’t do, including many bishops and Catholics at colleges and community organizations, have been making public pleas of late in light of a looming legal threat that has placed a Sept. 5 deadline in the program’s future. That’s the date Texas Attorney General Ken Paxton, along with nine officials from other states, have said they will sue the administration if the program continues. During his brief stint as Homeland Security chief, John Kelly, now the president’s chief of staff, wouldn’t commit to protecting DACA and suggested Congress should try to find a solution. It’s not clear what will happen to the 750,000 to 800,000 young beneficiaries if DACA is allowed to expire. “It’s scary and it’s real,” said DACA beneficiary Martinez to the crowd gathered at the rally, recognizing the feelings that many Dreamers face, but encouraging them to put their energies in the fight ahead. Weeks before, Martinez had expressed during an “Immigration Policy and Practice Under the Trump Administration” panel, the same resolve, particularly because living with the fear of deportation and having to work at jobs that pay under the table was a difficult reality. “I’ve been thinking about my life before DACA … I remember feeling really lost,” she said. Having tasted professional possibilities and a life without deportation worries, DACA recipients like Martinez say there’s no going back. The fight for DACA would only intensify as it faces threats but the young migrants are ready for “the fight for our lives,” she said. For Martinez, the memories of the initial fight for DACA keep her going. In Catholic circles, Dreamers have long counted with support. In an Aug. 15 opinion piece published by the political website The Hill, Archbishop John C. Wester of Santa Fe, New Mexico, voiced the support of “my brother bishops” for DACA. “We know DACA (recipients) have been given a chance to achieve their God-given potential,” Archbishop Wester wrote, adding that Congress, too, needs to find a solution to help the approximately 800,000 youth who will be affected should the program end. At the Aug. 15 rally, Catholics from various organizations showed up to support DACA and its beneficiaries, including Sara Benitez, Latino program director of the Washington-based Faith in Public Life. “Mr. President, you have the power to set these young people free so that they may add to the greatness of this nation. Somehow, we have forgotten that immigrants are people who may have needs but they also have gifts to offer,” said Larry Couch, director of the National Advocacy Center of the Sisters of the Good Shepherd. 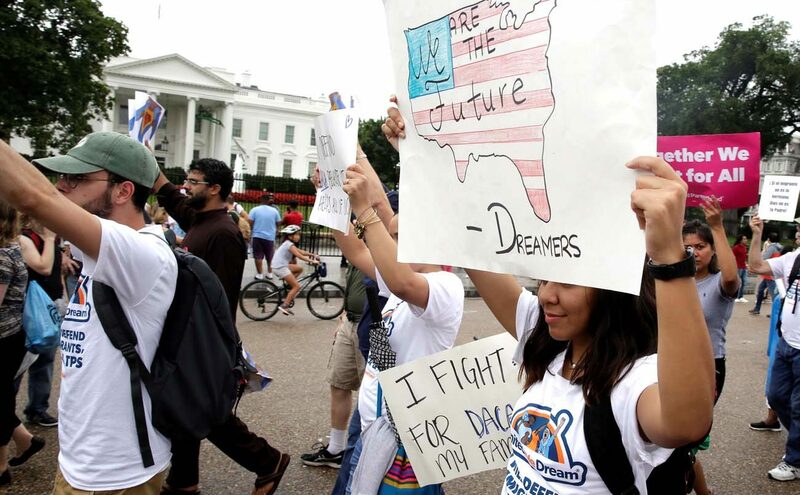 As he watched the crowd chant and cheer while celebrating DACA’s fifth anniversary, Franciscan Father Jacek Orzechowski recalled the words of Pope Benedict, who said that the church must not remain on the sidelines in the struggle for justice. The Franciscan priest was the first clergy member to offer prayers in a 22-day vigil to defend DACA that includes a group participating in daily prayers and a protest in front of the White House from Aug. 15 until the Sept. 5 deadline that the program faces. If you remember, he said, in the Gospel, Jesus told his counterparts, “Do not be afraid,” when they faced fears. Today, many of those gathered at the rally are facing fears. Families in the greater Washington area, as well as the rest of the country, are facing fears due to their immigration status, Father Orzechowski said. And the Gospel calls Christians, he said, to share the good news when people are afraid of what may happen in their future. “We as a church have a responsibility to accompany and to speak the message ‘do not be afraid,’ not just with words but with actions of accompaniment and solidarity,” he said. you failed to mention just a few things starting with these aren’t kids. Probably the biggest falsehood pushed on the American people by the MSM and Democrats. Yes it is called “Delayed” but the real goal is amnesty. To start with DACA economically is am obvious DRAIN on jobs for American Citizens. There is an estimated 800 THOUSAND DACA recipients in the US (more signing up every day.) That is 800 THOUSAND jobs American Citizens DON’T have. The MSM and Democrats would have you believe that all 800 thousand are not taking jobs Americans want (we’ve heard that speech for years). Wrong (this is another falsehood told to the American people..They’re not all picking strawberries they take good Jobs.Good enough jobs to buy homes, put their kids through college. Now Democrats and illegal alien activists brag DACA recipients have good jobs,are buying homes, paying taxes, etc. The GOAL (Democrats just haven’t figured this out yet) is for the AMERICAN CITIZENS to be employed, trained, sending their kid to college, buying homes and paying taxes. When I see the motivation by Democrats for illegal aliens using DACA I could only wish they had that same motivation for the citizens. It’s not the responsibility of the citizens of this country to support, pay for training, educate citizens from other country’s. There is also the public safety concerns with illegal aliens including DACA recipients. The bottom line is there should be no illegal aliens in our country. Deportation will save jobs and decrease the expense of illegal aliens. The price of illegal immigration both in expense and human suffering.. How many people have to pay for the moral beliefs of others?